The Kingdom is Sa’udi Arabia – the only country in the world to bear the name of the family that rules it. It is the story of a country that has haunted our imagination for centuries, and that haunts it still. Read the book that General Norman Schwarzkopf kept on his nightstand during the Gulf War! 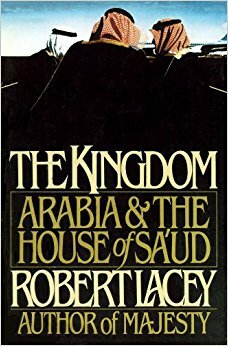 Robert took his family to live in Sa’udi Arabia while he researched the story of the Kingdom – a country of astonishing contrasts, where computer print-outs open with the words ‘In the name of God’, where men who grew up in goat-hair tents now dominate the money markets of the world, and where murderers and adulterers are executed in the street. The Kingdom is also the story of the House of Sa’ud, a dynasty that has fought its way from poverty and obscurity to wealth and power. A family characterised by fierce loyalty among its members, ruthlessness towards its enemies, and dedication to one of the world’s most severe and demanding creeds. In the updated version of his book that Robert Lacey is currently preparing, he examines the challenges facing the world’s wealthiest royal family. What are its chances of survival in the 21st century?